Austria holidays, Salzburg, Kaprun, Zell am See and so much more: Snow Park Mellow Park on the Kitzsteinhorn above Kaprun opens. 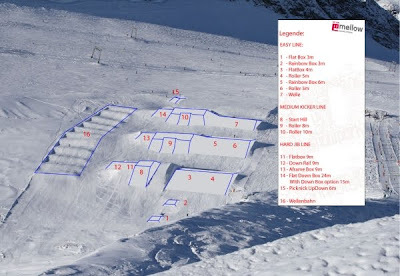 Snow Park Mellow Park on the Kitzsteinhorn above Kaprun opens. The Mellow Park ski park on the Kitzsteinhorn glacier above Kaprun opens its doors for the "White out" of the official ski season in Kaprun, this normally takes place around the first or second weekend in November. With the benefit of the glacier the start of the ski season is almost guaranteed. Planet snow along with other weather forecasts can give a good prediction of snow conditions With reports of snow "Snow looking Pretty good" across Europe, it sets a white back cloth to build on. Planet Ski reports that RyanAir is offering a free ski transfer with flights booked over the next few days. Looks like an extra incentive to get that ski holiday booked?